The Portable Baptistry Jr. offers the contemporary appeal of the full-size Portable Baptistry, but with the ultimate in portability and transportability. With the Pastor dry, outside the Portable Baptistry Jr., the candidate is seated for full-immersion baptism. After baptism service it is quickly drained and simply stored away in a box less than 2 ft. cube, or smartly transported in the backseat of a small car. 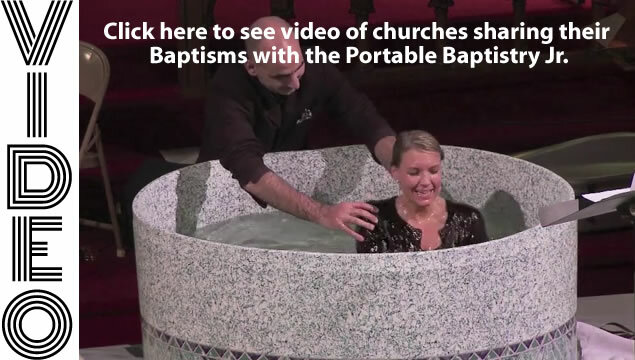 The Portable Baptistry Jr. is easily set up by one person in minutes. The Portable Baptistry Jr. comes with the essential items that enable you to set-up and baptize the day it arrives. Just add water. 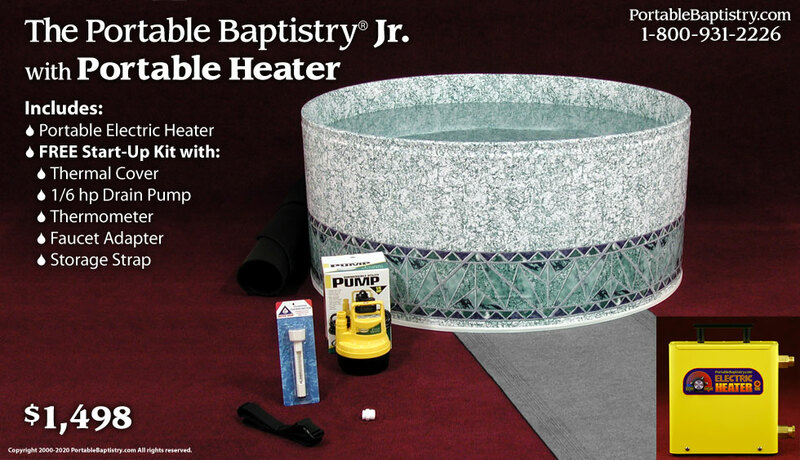 This Portable Baptistry Jr. Package features the Portable Baptistry Heater. This Heater is also the popular choice for heating the full-size Portable Baptistry, and is a great option if you have, or eventually consider having, both sizes of Portable Baptistries from PortableBaptistry.com. 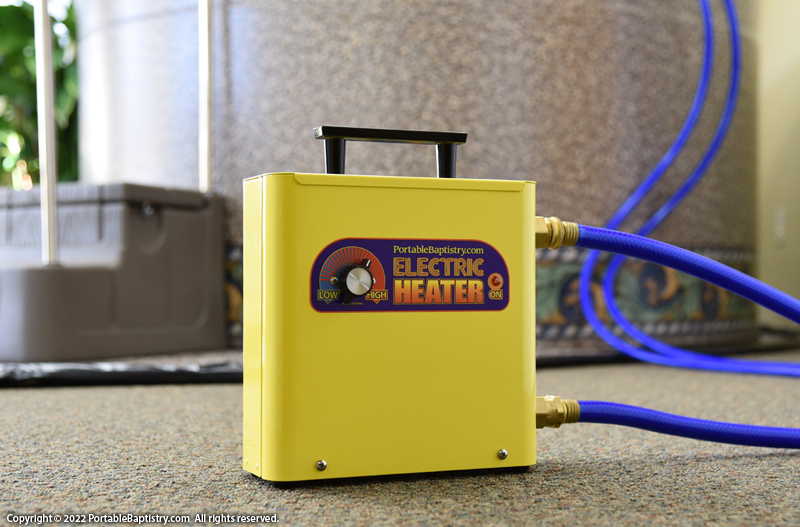 The Portable Baptistry Heater heats the Portable Baptistry Jr. in approx. 12 to 14 hours on 110 volt. When converted to 220 volt, the Portable Baptistry Heater heats the Portable Baptistry Jr. in approx. 3 to 4 hours. Requiring no installation, it operates in conjunction with the portable Drain Pump that is included with every Portable Baptistry Jr. purchase. See diagram below. Amazingly compact, the Portable Baptistry Heater is the size of a toaster (just 10 sq. inches) and can be conveniently stored on a shelf when not in use. The Portable Baptistry Jr. also includes your choice of decorative Motifs. Click on the individual Motif image or name to enlarge. Then choose which Motif you want below. 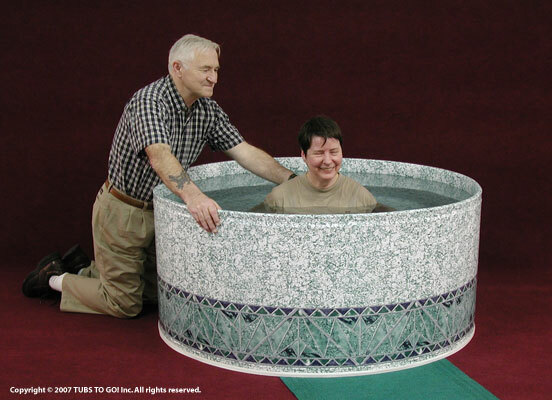 For Baptistry dimensions see the Specifications page. The Ground Shipping Charge for this item in the continental US is approx. $100. Please allow approx. 3 to 14 days for delivery from the date it is shipped. Faster Air Shipping (1 to 2 days) is also available. International Orders please call or Email for shipping quote. Liner Motifs are reversible to a Solid Color on the reverse side. Rollover each Motif to see the reverse color. Click on each Motif to enlarge. What Add-ons are right for you?